Keep things going the next day: identify plant and animal life at Monkey Park, then identify plant and animal life at Wildlife Areas, and then get a new perspective on things with Boat Tours & Water Sports. To find maps, other places to visit, photos, and more tourist information, refer to the Tamarindo day trip planning site . Toronto, Canada to Tamarindo is an approximately 11-hour combination of flight and bus. You can also do a combination of flight and shuttle; or drive. The time zone changes from Eastern Standard Time to Central Standard Time, which is usually a -1 hour difference. Finish your sightseeing early on the 13th (Wed) so you can drive to Santa Teresa. Start off your visit on the 14th (Thu): stroll through Playa Santa Teresa, then relax and rejuvenate at some of the top local wellness centers, and then kick back and relax at Playa Hermosa. To see ratings and other tourist information, refer to the Santa Teresa trip itinerary planning site . You can drive from Tamarindo to Santa Teresa in 3.5 hours. Alternatively, you can do a combination of bus and taxi. Wrap up your sightseeing on the 14th (Thu) early enough to travel to Uvita. On the 15th (Fri), get up close to creatures of the deep with a dolphin and whale watching tour and then tour the pleasant surroundings at Rancho La Merced National Wildlife Refuge. On the next day, kick back and relax at Uvita Beach, look for all kinds of wild species at Alturas Wildlife Sanctuary, then take in the dramatic scenery at Uvita Waterfall, and finally look for gifts at Discount Liquor Wine & Cigars. To see other places to visit, more things to do, ratings, and other tourist information, use the Uvita online journey planner . You can do a combination of taxi and ferry from Santa Teresa to Uvita in 4 hours. Other options are to drive; or do a combination of bus and ferry. Finish your sightseeing early on the 16th (Sat) to allow enough time to drive to Manuel Antonio. Take a break from the city and head to Parasailing & Paragliding and Zipline. Discover out-of-the-way places like Canyoning & Rappelling Tours and Villa Vanilla / Rainforest Spices. When in Manuel Antonio, make a side trip to see Rainmaker Park in Parrita, approximately 46 minutes away. Next up on the itinerary: kick back and relax at Playa Manuel Antonio and relax and rejuvenate at some of the top local wellness centers. To find ratings, maps, more things to do, and tourist information, you can read our Manuel Antonio online trip itinerary maker . Traveling by car from Uvita to Manuel Antonio takes 1.5 hours. Alternatively, you can take a bus. Cap off your sightseeing on the 19th (Tue) early enough to go by car to Monteverde. Head to Monteverde Hummingbird Gallery and Alas y Raicesfor some retail therapy. Step off the beaten path and head to Reserva Bosque Nuboso Santa Elena and Zipline. The adventure continues: look for all kinds of wild species at Monteverde Cloud Forest Biological Reserve, take in nature's colorful creations at Monteverde Orchid Garden, take in the exciting artwork at Arte Jaguar Gallery, and take a pleasant ride with a tour on horseback. 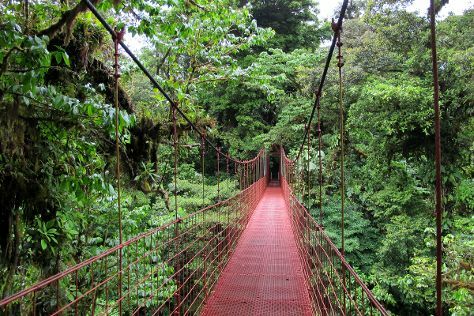 For where to stay, maps, more things to do, and more tourist information, read our Monteverde trip builder . You can drive from Manuel Antonio to Monteverde in 4 hours. Alternatively, you can do a combination of bus and shuttle; or take a bus. Cap off your sightseeing on the 22nd (Fri) early enough to go by car to La Fortuna de San Carlos. Visiting Butterfly Conservatory and Ecocentro Danaus will get you outdoors. Explore hidden gems such as Arenal Natura Ecological Park and Wood & Art Gallery. 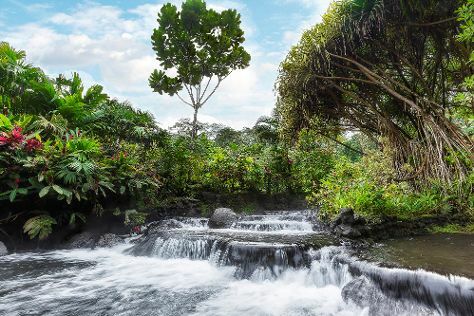 There's much more to do: take in the natural beauty of Tabacon Hot Springs, relax and float downstream with a rafting and tubing tour, contemplate the geological forces at Arenal Volcano (Volcan Arenal), and take in the dramatic scenery at La Fortuna Waterfall. To see ratings, other places to visit, more things to do, and more tourist information, read La Fortuna de San Carlos day trip app . You can drive from Monteverde to La Fortuna de San Carlos in 3 hours. Another option is to take a shuttle. Wrap up your sightseeing on the 26th (Tue) early enough to drive to Puerto Viejo de Talamanca. Kick off your visit on the 27th (Wed): soothe aching muscles at some of the top local wellness centers, kick back and relax at Playa Chiquita, and then tour the pleasant surroundings at Punta Uva Beach. Here are some ideas for day two: admire the natural beauty at Tree of Life Wildlife Rescue Center and Botanical Gardens, then identify plant and animal life at Tarantulas Way, and then kick back and relax at Playa Cocles. To find traveler tips, other places to visit, reviews, and other tourist information, go to the Puerto Viejo de Talamanca attractions planner . You can drive from La Fortuna de San Carlos to Puerto Viejo de Talamanca in 5 hours. Other options are to do a combination of car and bus; or take a bus. Finish up your sightseeing early on the 28th (Thu) so you can travel back home.